A compelling and informed narrative of the war in Vietnam 1945-75, seeking to answer why America "lost" the war in Vietnam. Since the fall of Saigon in 1975 there have been many books published on why (and whether) America lost the war in Vietnam. The senior American commander in charge of prosecuting the war during its buildup and peak of fighting, Admiral U.S.G. Sharp, concluded his memoir, saying: "The real tragedy of Vietnam is that this war was not won by the other side, by Hanoi or Moscow or Peiping. It was lost in Washington, D. C.” This remains an all too common belief. The stark facts, though, are that the Vietnam War was lost before the first American shot was fired. In fact, it was lost before the first French Expeditionary Corps shot, almost two decades earlier, and was finally lost when the South Vietnamese fought partly, then entirely, on their own. 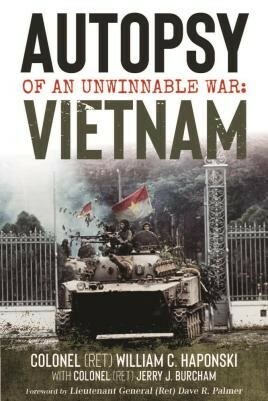 Offering an informed and nuanced narrative of the entire 30-year war in Vietnam, this book seeks to explain why. It is written by a combatant not only in six violent, large battles and many smaller firefights, but a leader with a full range of pacification duties, a commander who lost 43 wonderful young men killed and many more wounded, men who were doing what their country asked of them. This story is the result of a quest for answers by one who, after decades of wondering what it was about - what was it all about? - turned to a years-long search of French, American, and Vietnamese sources. It is a story of success on the one hand, defeat on the other, and the ingredients of both, inspirational or sordid as they may be. It is a story mostly lived and revealed by the people inside Vietnam who were directly involved in the war: from leaders in high positions, down to the jungle boots and sandals level of the fighters, and among the Vietnamese people who were living the war. Because of what was happening inside Vietnam itself, no matter what policies and directives came out of Paris or Washington, or the influences in Moscow or Beijing, it is about a Vietnamese idea which would eventually triumph over bullets.